This is an idea that came together as a result of some creative Monday-night foraging in the fridge and it works so well that it seems strange to me now that I didn’t shop especially for it the first time I made it. I certainly do these days, let me tell you. 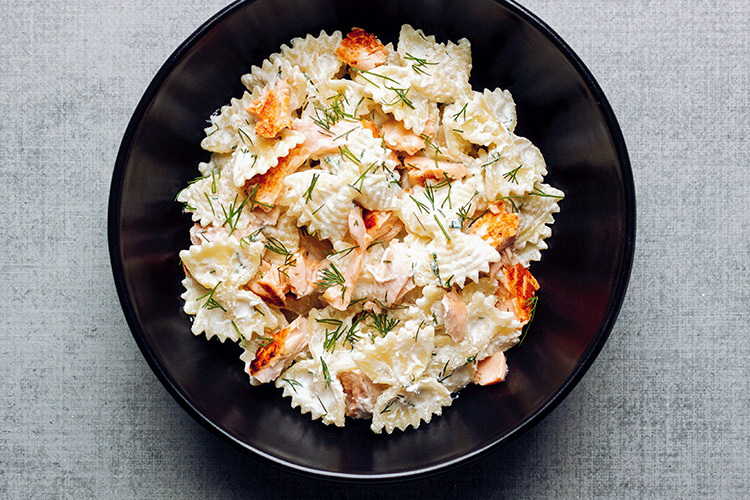 Because the salmon is only seared rather than cooked all the way through – the only way I can cook salmon, although doneness is your call, of course – everything comes together in the time it takes to cook the pasta. It’s delicate, in its own way, but hearty and comforting enough, as pasta tends to be, that it’s a joy to both make and eat at the end of even the most harrowing day. Cook’s tip: Pasta cooking water is your friend. Dip a small cup into the water before you drain it and use it, a little at a time, to help bring any pasta sauce to the perfect consistency. Here, lemon juice starts the process of liquifying the ricotta, but you don’t want it to be overly lemony. If you need to thin it more, use a little pasta water to bring it to the consistency of lightly whipped cream. Place the ricotta in a roomy bowl (you’ll be using it to toss the pasta) and stir in the lemon juice with a fork. Mix until smooth. Add the chopped dill and mix to combine. Season well with salt and pepper. Set aside. Cook the pasta in plenty of lightly salted water for the time recommended on the packet. Meanwhile, heat the olive oil in a small frying pan or skillet over medium-high heat. Fry the salmon on both sides for 2 minutes or side, or until cooked to your liking. Transfer to a plate or cutting board and flake with a fork. Drain the pasta and toss it in the lemony ricotta. Add the salmon and toss gently. Transfer to serving dishes, scattering over a little more chopped dill to finish.